Growing up in rural Guatemala is hard. No one would blame 22-year-old Berta Alicia Chancho Vit had she followed the normal path: Go to primary school for a few years. Drop out to work in the fields or the home. Get married too young. Have children. Watch them follow in your footsteps. Grow old under the weight of unfulfilled dreams. But Berta Alicia refused to follow the normal path. Instead, she blazed an entirely new one. 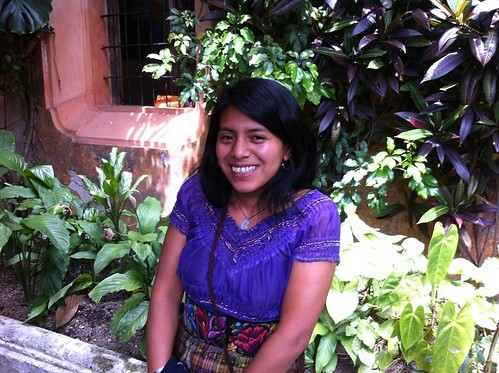 “I have always wanted to study and graduate from high school,” Berta Alicia says. While that might seem like a reasonable goal, it is anything but easy—in rural Guatemala, 80% of indigenous students drop out of school by the seventh grade. Thanks to Berta Alicia’s diligence in primary school, she was accepted into Cooperative for Education’s Rise Youth Development Program so she could study through middle school and high school. This was the life-changing chance she had been waiting for, so she got right to work. At the age of 18, she became the first in her family to graduate from high school. She spent the following year teaching at the local middle school. By all accounts, Berta Alicia was a success story. But she still wasn’t satisfied. Berta Alicia decided that she wanted to learn English in order to pursue better job opportunities. She received a scholarship from a local foundation to study the language, and spent the next six months attending classes five days a week. At the end of the term, she took an English exam in the hopes of getting hired by the international call center that partners with the foundation. She failed the test. She kept studying and took the exam again two months later. She failed again. She kept studying and took the exam a third time. She failed a third time. She returned home for a few months to decide how to proceed. Feeling defeated, Berta Alicia wanted to start looking for a job in a different field, but her father encouraged her to stick with her dreams. She went back to the center and faced her failures head on. This time, she passed the test. Despite all of the obstacles in her path, Berta Alicia rewrote her life’s narrative. Instead of dropping out after primary school, she got the tools and the support to graduate from high school, thanks to the Cooperative for Education Rise Program. Instead of accepting a marriage proposal at age 16, she said no so that she could finish her studies. Instead of giving up her English lessons and wondering about what could have been, Berta Alicia is living her dream. If she had not received a Rise sponsorship to start the seventh grade, Berta Alicia would likely not be working in a call center right now, fluent in English and making four times what her father does. Cooperative for Education takes students with dreams and gives them the tools they need to make those dreams a reality. Thanks to YOUR generosity, students like Berta Alicia have a chance to blaze their own trails instead of being stuck in the perpetual cycle of poverty. Berta Alicia is always looking for chances to practice her English. She often goes to the tourist city of Antigua to try to chat with foreigners, but unfortunately they are often suspicious and don’t want to talk to her. She’s not deterred by this problem. It’s just one more challenge to overcome, and Berta Alicia is very good at finding solutions.